Trust Me I'm a Doctor asked nutrition scientist Prof Paul Sharp, from King's College London, to find the foods you should be eating to boost iron levels naturally. Red meat is particularly rich in the sort of iron bodies find easy to absorb but these days many people are either cutting back on their red-meat consumption or cutting it out altogether. And there are good sources of iron in dark-green leafy vegetables, such as kale and spinach, and pulses, such as peas and lentils. 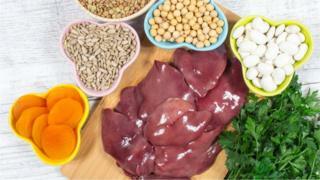 The problem is you don't absorb as much iron from plant sources as you do from red meat. Then, there is the iron you can get from fortified bread and breakfast cereals, though again it is not always in a very absorbable form. To demonstrate this, a neat party trick is to grind up the cereal, add some warm water and you can actually use a magnet to draw the iron filings out of the mush. How you prepare your food and what you drink with it can also change how much iron you absorb. To demonstrate this, Prof Sharp carried out some experiments to mimic human digestion. The tests mimicked the effect of the enzymes involved in digesting food and the chemical reaction that occurs in human gut cells to show how much iron would be absorbed. Take the test: Could eating more iron stop you feeling tired? Prof Sharp showed that if you drink orange juice with your fortified breakfast cereal you absorb much more iron than when eating the cereal on its own - because orange juice contains vitamin C, which makes it easier to absorb iron from food. But, disappointingly, if you drink coffee with your morning bowl of cereal, then that will mean you absorb significantly less iron. Image caption Raw cabbage anyone? Why? Well, according to Prof Sharp, it's because coffee is full of chemicals called polyphenols that are very efficient at binding to the iron and making that iron less soluble. So, if a fortified cereal is your breakfast of choice, then having a small glass of orange juice or an orange will help increase your iron uptake. You might also want to consider postponing your morning coffee until at least 30 minutes after you've eaten. But what if you prefer getting your iron from more natural sources? Raw cabbage is a good source of available iron but we found that steaming it lessened the amount of available iron while boiling reduced it even further. That's because, like oranges, cabbage is rich in vitamin C - and when you boil it, the vitamin C is released into the cooking water. So, if you want to get the maximum nutrients from your cabbage, eat it raw (an acquired taste) or steam it. The same is true of other veggies that contain both iron and vitamin C, such as kale, broccoli, cauliflower and watercress. But, strangely enough, spinach is completely different. We found that when we boiled the spinach, it actually released 55% more "bioavailable" iron than when eaten raw. Prof Sharp says: "Spinach has compounds, called oxalates, and they basically trap the iron. "When we cook spinach, the oxalate is released into the cooking water, and therefore the iron that remains will be more available for absorption." Finally, what about the bread? We found the best bread for delivering iron was sourdough bread. That's because wheat contains a chemical called phytic acid that slows down iron absorption by the body. When sourdough bread is made, the fermentation process breaks down the phytic acid so the iron that remains is more available for absorption. There are more diet tips on the Trust Me website. Trust Me I'm a Doctor continues on BBC Two on Wednesday, September 12, at 20:00.